Phyllocoptes fructiphilus Keifer is a tiny eriophyid mite associated with most rose species and cultivars, especially in the eastern half of the USA. Most significantly, this mite is the vector of a devastating viral disease of roses called Rose Rosette Disease (RRD). This virus is a negative-strand RNA virus in the Emaravirus genus, which includes fig mosaic virus, raspberry leaf blotch virus, pigeonpea sterility mosaic virus and High Plains disease of maize and wheat, all of which are transmitted by other eriophyid mite species. The genome of this virus has been partially sequenced, which may allow geneticists to develop cultivars of roses that are resistant to RRD. The disease diagnosis can be confirmed with a molecular test called the polymerase chain reaction (PCR). Figure 1. Phyllocoptes fructiphilus Keifer is a tiny eriophyid mite and cannot be seen without magnification. Like all eriophyid mites, it has only two pairs of legs at the anterior of its worm-like body. Photograph by USDA, Agricultural Research Service. 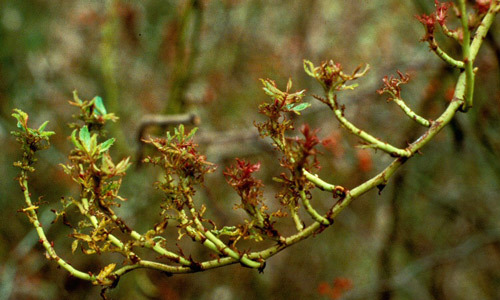 Rose Rosette Disease causes red coloration of new growth, excessive thorniness, elongated shoots, deformed blooms, witches broom of shoots (Fig. 2) and, ultimately, death of the plant. Rose Rosette Disease does not appear to be transmitted mechanically, although disinfesting all tools used on infected roses may be a useful precautionary effort. The virus does not survive well in soil, but the virus may survive in rose roots in the soil, so all roots should be removed from the soil when infected roses are removed. The disease somewhat resembles damage caused by herbicides, so diagnosis by PCR for the virus or by presence of the mites is helpful in discriminating between herbicide damage and RRD. Figure 2. Feeding by the mite Phyllocoptes fructiphilus results in transfer of the virus to roses. Mites prefer to feed on tender new growth, and the virus modifies plant development to produce red foliage and stems, excessive thorniness, witches broom of shoots, and, ultimately, death. The mites are typically found in the apex of the rose shoots, where they feed and reproduce. Photograph by USDA, Agricultural Research Service. Although Keifer described finding Phyllocoptes fructiphilus on Rosa californica in California in 1940, it is not found on commercially produced roses grown in the southern San Joaquin Valley at present. Whether this is due to the pesticides applied to these roses or to climatic conditions that result in low relative humidity is unknown. However, Phyllocoptes fructiphilus can be found on roses in the eastern half of the USA and it, and the disease it transmits, appear to be spreading into the New England states. As of 2013, this mite is not known to occur in Florida or the southern half of other Gulf States. It is interesting that the mite and the disease are not found on cultivated roses grown in large-scale nurseries in dry areas of California and Arizona, despite having been first identified on roses in California. Thus, it is not entirely certain what the native range or native host of the mite may be. Most assume that Phyllocoptes fructiphilus is native to North America on native rose species and has adapted to multiflora roses and cultivated roses. Phillocoptes fructiphilus has become very abundant on multiflora roses (Rosa multiflora), which are introduced noxious weeds, especially in many states in the eastern half of the USA. Multiflora roses were introduced into the USA from Asia about 200 years ago, so the question arises as to whether the mite actually came from Asia with multiflora roses. The mite and the disease are not known to occur outside the USA, but this could be due to a lack of economic impact in Asia. Lack of knowledge about a tiny mite is not unusual when it is biologically controlled in its area of origin. This mite can be spread by the wind and by contaminated clothing and equipment. It also is possible that it can disperse through phoresy (attaching itself to insects). As a result, the distribution of the mite and RRD is expanding. Figure 3. 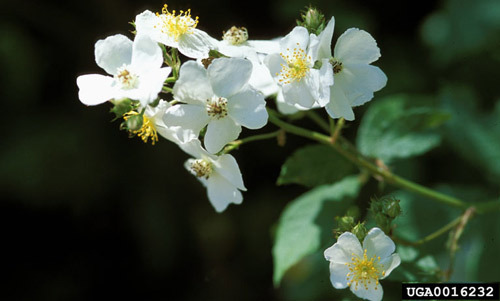 Multiflora rose, Rosa multiflora,is a noxious weed in many states and the mite and RRD have been suggested as biological control agents for this weed. Unfortunately, the mite also attacks ornamental roses so it is no longer considered a potential multiflora weed control agent. Photograph by James H. Miller, USDA Forest Service, Bugwood.org. Figure 4. 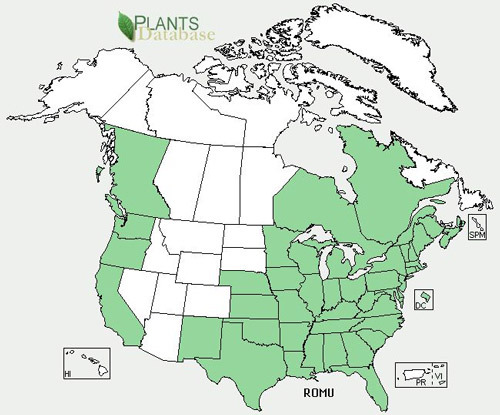 Distribution of multiflora roses, Rosa multiflora, in the USA. Map by USDA. Phyllocoptes fructiphilus is 140-170 microns in length and 43 microns wide, so it is hard to see unless growing shoot tips and bud scales are examined under magnification. It is amber to light yellow in color and has no accepted common name. Phyllocoptes fructiphilus has multiple generations a year. Mated adult females (deutogynes) overwinter under bark, old bud scales, and on living rose tissues. The overwintering females move onto developing shoots to deposit eggs, producing about one egg per day for about 30 days. The eggs hatch in 3 to 4 days and each protonymph and deutonymph requires about 2 days to develop. As a result, an egg can develop to adulthood in about one week, depending on the temperature. 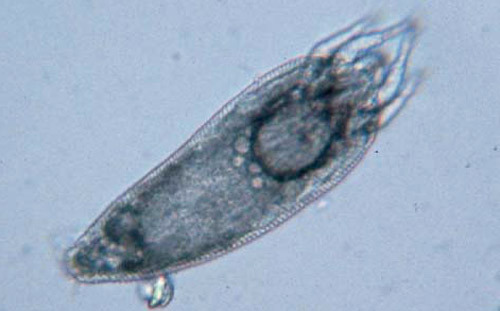 Both males and summer (protogyne) females are produced by arrhenotoky (females are diploid and males are haploid and produced from unfertilized eggs). This means that an unfertilized female can deposit a haploid (male) egg and become inseminated by her male offspring after he becomes an adult. Males deposit spermatophores on the substrate and females take up the spermatophores into their genital opening to fertilize eggs (that become daughters). A mated female may produce both fertilized (female) eggs and unfertilized haploid eggs that become males. Multiple generations develop until the weather turns cold in the fall. In the fall, deutogyne females are produced that enter their overwintering sites. Phyllocoptes fructiphilus may be sensitive to low relative humidity, with periods of drought associated with low population densities. Very high densities of mites are found on plants with symptoms of RRD, suggesting that the virus-infected rose plant is more suitable for mites because infected roses have more apical shoots with tender new growth, which is where these mites thrive. Phyllocoptes fructiphilus appears to survive on a wide array of Rosa species and cultivars, including the non-native multiflora rose. There are anecdotal accounts that some cultivars are possibly resistant to the mite (or the virus), but there are no clearly resistant cultivated rose cultivars known at present. Breeders are attempting to identify possible resistance genes in order to develop resistant cultivars to either the mite or the virus. Breeding for RRD resistance is important for the future of rose culture in the USA and, possibly, the world’s rose culture. 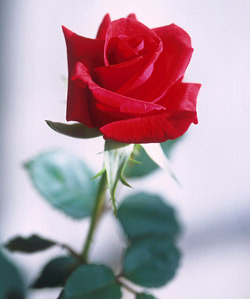 Roses are valued for their beauty and scent and the rose is the national flower of the USA. Cut roses, rose bushes and rose oil are commercially valuable. Commercial rose producers plant tens of thousands of roses each year. Cultivation is highly labor-intensive due to the fact that pruning, spraying, fertilizing, and harvesting are done by hand. Rose production employs workers in farming, transportation, marketing, and delivery to wholesale and retail markets. Internationally, the cut floral industry, of which roses account for two-thirds of all such plants, exceeds $40 billion dollars per year. There is no guarantee that RRD and the mite vector can be contained in the USA due to the export of roses around the world, so the economic impact of this mite and the disease it transmits could increase. Figure 5. Cultivars of roses are grown for their beauty and scent. Thousands of different rose cultivars have been developed through breeding. Photographs by USDA, Agricultural Research Service. Figure 6. 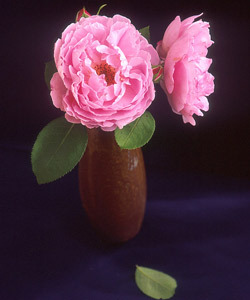 Cultivars of roses are grown for their beauty and scent. Thousands of different rose cultivars have been developed through breeding. Photograph by USDA, Agricultural Research Service. Phyllocoptes fructiphilus should be managed because it is the vector of RRD. Guidelines provided by Star Roses and Plants/Conard-Pyle for managing the mite and the disease include: 1) Once a rose is identified as RRD-infected, the plant should be removed immediately by burning or disposing of it in a sealed plastic bag. Do not add it to your mulch pile or compost bin. 2) Because the disease can possibly spread from RRD-infected rose roots to a neighboring rose plant, removal of the rose with RRD should include removal of its roots, as well. 3) Pruning of roses may eliminate mites and eggs, which are found in the crevices of cane petioles and in new growth. 4) Remove any multiflora roses in the vicinity of your cultivated roses by using herbicides, repeated cutting or mowing 3-6 times a growing season for 2-4 years, or by application of a systemic herbicide to cut stumps or regrowth. However, seeds of multiflora roses are numerous and long lived in the soil, so vigilance is required to eliminate multiflora roses in the vicinity of cultivated roses. Robins, mockingbirds, starlings, red-winged blackbirds, and other species feed heavily on multiflora rose hips in fall and winter, and seeds pass rapidly through their digestive tracts and remain intact, resulting in increases in the germination rate, while the bird feces provide fertilizer to seedlings. It is unclear which pesticides are effective to manage this mite. Because the mite is “hidden” in the buds on the growing tips, coverage is difficult to achieve. However, it is known there are natural enemies (predatory mites, fungi) of many eriophyid species, so the use of “soft pesticides”, such as light horticultural oils, sulfur, soaps, etc., may preserve the naturally occurring natural enemies. The use of augmentative biological control, in which releases of specific natural enemies are made to control the pest, has not been investigated at this time. It is unknown which predatory species might be effective, or at what application rate. Several predatory mites (phytoseiids) are known to be effective natural enemies of eriophyid mites in orchards and vineyards, so it is likely that naturally occurring predatory mites (Acari: Phytoseiidae) could be effective in suppressing Phyllocoptes fructiphilus. However, these predatory mites may be susceptible to pesticides used to control other pests and diseases of roses, so studies are needed to confirm their effects on predatory mites. Because even a single mite could, in theory, transmit the virus, biological control by itself can only reduce the pest population and thus, reduce the incidence of RRD. Ultimately, the development of rose cultivars that are resistant to either the mite or the virus (or both) is likely to provide a more-effective control of RRD in cultivated roses. 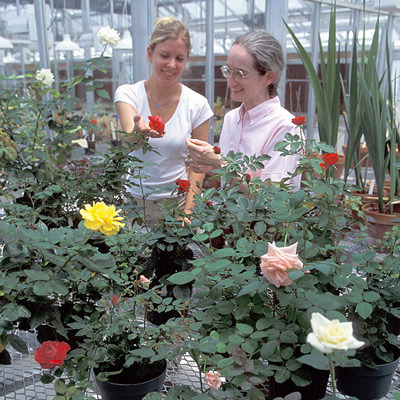 Selection of rose cultivars using traditional breeding methods may be laborious and slow; it could take years to identify resistant/tolerant sources for breeding to commercial cultivars with desirable ornamental traits. The development of genetically modified horticultural roses using recombinant DNA methods might provide a more rapid resistance to the mite or RRD and the public may accept such genetically modified roses because roses typically are not used as food. Reliance on host-plant resistance, once developed, can be risky because the mite and the virus could become resistant to the host-plant resistance. Thus, a multi-tactic approach will still be needed to manage RRD vectored by Phyllocoptes fructiphilus. This should include eradicating multiflora roses within 300 feet of cultivated roses, removing infected cultivated roses and their roots, preservation of natural enemies of the mite by use of “soft” pesticides to control the mite and other rose pests and diseases. Likewise, reliance on chemical control as the primary tool is risky; at least nine other species of eriophyid mites have developed resistance to pesticides. Eriophyid mites are so tiny that they are difficult to detect by plant inspectors using hand lenses. As a result, at least 80 species of eriophyids have become invasive alien species around the world and this mite (and the virus it transmits) could become a pest in other rose-growing regions of the world. Amrine JW, Hindal DF. 1988. Rose rosette, a fatal disease of multiflora rose. West Virginia Agricultural Experiment Station Circular 147: 1-4. Amrine JW. 1996. Phyllocoptes fructiphilus and biological control of multiflora rose. In: Lindquist EE, Sabelis MW, Bruin J (Eds.) Eriophyoid Mites-Their Biology, Natural Enemies and Control. Elsevier, Amsterdam, pp. 741-749. Amrine JW. 2002. Multiflora rose. In: Van Driesche et al. Biological Control of Invasive Plants in the Eastern United States. USDA Forest Service Publication FHTET-2002-04, 413 p.
Amrine JW, Hindal DF, Williams R, Appel J, Stasny T, Kassar A. 1990. Rose rosette as a biocontrol of multiflora rose. Proceedings of the Southouthern Weed Science Society 43: 316-319. Comard-Pyle. 2013. Rose rosette disease. Prevention Guide. Star Roses and Plants/Conard-Pyle. Doudrick RL, Enns WR, Brown MF, Millikan DF. 1986. Characteristics and role of the mite, Phyllocoptes fructiphilus (Acari, Eriophyidae) in the etiology of rose rosette. Entomological News 97: 163-172. Epstein AH, Hill JH. 1999. Status of rose rosette disease as a biological control for multiflora rose. Plant Disease 83: 92-101. Hinda DF, Wong SM. 1988. Potential biocontrol of multiflora rose, Rosa multiflora. Weed Technology 2: 122-131. Jesse LC, Moloney KA, Obrycki JJ. 2006. Abundance of arthropods on the branch tips of the invasive plant, Rosa multiflora (Rosaceae). Weed Biology and Management 6: 204-211. Keifer HH. 1940. Eriophyid studies VIII. Bull. Dept. Agric. State of Calif. Vol. XXIX, No. 1. Kostiainen TS, Hoy MA. (1994). The Phytoseiidae As Biological Control Agents of Pest Mites and Insects. A Bibliography (1960-1994). University of Florida Institute of Food and Agricultural Sciences Monograph 17, Gainesville, FL. Laney AG, Keller KE, Martin RR, Tzanetakis IE. 2011. A discovery 70 years in the making: characterization of the rose rosette virus. Journal of General Virology 92: 1727-1732. Mielke-Ehret N, Muhlbach HP. 2012. Emaravirus: a novel genus of multipartite, negative strand RNA plant viruses. Viruses 4: 1515-1536. Navia D, Ochoa R, Welbourn C, Ferragut F. 2010. Adventive eriophyoid mites: a global review of their impact, pathways, prevention and challenges. Experimental and Applied Acarology 51: 225-255. Photographs and Map: USDA, Agricultural Research Service, James H. Miller, USDA Forest Service, Bugwood.org.